The ruling Zanu PF party claims that the United States of America tried to sabotage their campaign by blocking them from wiring their transaction to a Chinese firm which printed the party’s regalia until the party sought ways of circumventing the restrictions and get the money to China without detection by New York, TellZim News has heard. Addressing an inter-district meeting last weekend at Masvingo Polytechnic College recently, Zanu PF politburo member and principal director of the Hebert Chitepo School of Ideology, Munyaradzi Machacha lashed out at America for trying to effect regime change hiding behind MDC Alliance leader, Nelson Chamisa. It was said that the Chinese firm which printed the Zanu PF campaign material had refused to release the regalia until they were paid, a development which caused delays in the arrival of the regalia. Most, if not all, global financial transactions go through New York, and are closely monitored by the US treasury department and CIA which have power to freeze dealings suspected to be involving sanctioned individuals, organisations, states and terrorist movements. 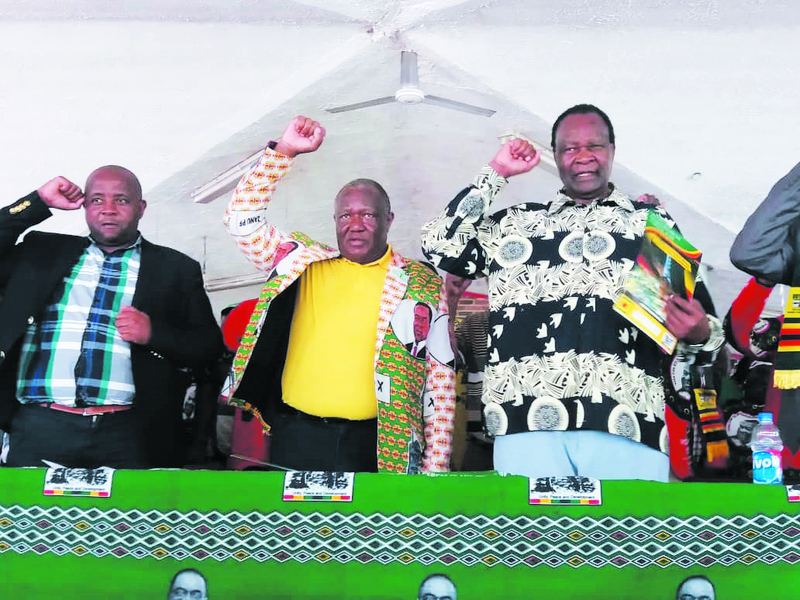 Flanked by Zanu PF chief whip Pupurai Togarepi and Senator Josaya Hungwe, Machacha declared that the United States was the real enemy of the country and should be treated as such in any dealings the country finds itself in with them. Machacha narrated how America tried to sabotage and derail the Zanu PF campaign by making sure that the payment to China failed. “We are fighting a formidable enemy. America mukono. Hachisi chana chidoko chaunorova mbama chochema chichimhanya kumakumbo amai (America is a real giant; it’s not like a child one can easily beat up). “We had a problem with regalia during our campaigning period. The regalia was done in China and it was finished in time. The problem came when we wanted to pay the supplier his money. He said he was not going to release the regalia until we wired his payment into his account. “We wired the money and it was hanging for about a week then it reflected back into our account. We tried wiring the money again and it spent two weeks suspended before reflecting back into our account. 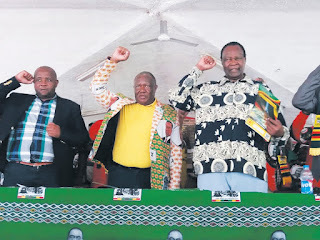 “President Mnangagwa then thought of other ways of getting the money to China, avoiding monitoring by the Americans and we successfully delivered the money and our regalia was released but it was too late because people had already started voting,” said Machacha. He said that planes loaded with regalia arrived in the country late and there were heaps of regalia awaiting distribution at the party’s headquarters in Harare. “You should go and tell our people that we have a lot of regalia in Harare and it is coming. We know our people are not happy but we will give all our Members of Parliament enough to distribute to their respective constituencies as we celebrate our victory. “The issue of regalia left a lot of people dejected and we had cases where people where fighting to access it. There are plenty of t-shirts, caps, scarfs and wrapping cloth enough for everyone and ready for distribution,” said Machacha. Machacha said the Americans were masters of deception; they would put a nice face to try and get close and do their mischief. He said the people of Zimbabwe should be extremely cautious because America is an enemy that never forgives. “The enemy which had for long been grabbing us by the throat seems to be letting go. This will see our economy flowering because the sanctions they illegally imposed on us will eventually be lifted. “We will start to experience a better life but let me warm you Masvingo that this enemy does not forgive. When you date America you have to go to bed with one eye open because you never know when the enemy may strike. “You have to sleep with a weapon under the pillow so that when the enemy strikes, you will have something with which to defend yourself. Yes, Chamisa might be our enemy here but the one behind him is the greatest and most powerful foe we ever had,” said Machacha. He said the ‘imperialists’ who spread the red carpet for President Mnagagwa and ‘gave him kisses’ were all wolves in sheep’s clothing, giving reference to Libya’s fallen dictator Muammar Gaddafi. “Look what they did to Gaddafi. Libya was flourishing and the same Americans who pretended to be Gaddafi’s friends killed him. We need our people to remain united so that we will not give any room to the enemy to exploit.